This month, we profile one of our Green Business Network members that has made the successful jump from being a small, respected, local green business, to making a go of it in the era of the Internet. The Wedge Community Co-op started as a local, cooperative grocery store in 1974, as the first certified organic store in Minnesota. Over the years, as the co-op expanded, so did its customer base and its range of products, until finally the brick-and-mortar shop ran out of space. From that limitation was born the solution of an online store, which has grown into a major national source for Fair Trade products – tea and coffee, dinnerware, table linens, housewares, and more. Green America: What does your business do, and what is your most popular product? Jessie Jacobson: Wedge Worldwide is an online retail storefront that carries an array of earth-friendly products available for purchase to our expanding customer base. Our aim is to empower our shoppers so they are able to make lifestyle choices that support their well-being, their health and the health of our planet. 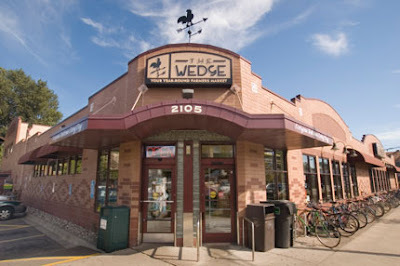 Wedge Worldwide is a branch of our member-owned brick and mortar store: the Wedge Co-op, a natural food store in Minneapolis. It is one of the largest co-op grocers in the nation. Our Wedge Worldwide Web site and physical store are available to all shoppers; you do not need to be a co-op member in order to buy from us. The products we offer reflect our buying-philosophy and our dedication to : eco-friendly and natural products, organics, Fair Trade, social responsibility, locally made products, and recycling. The easy-to-navigate icons that we feature on our product pages describe our buying-philosophy and reflect our values. They are our way to guide you through Wedge Worldwide, to experience every product. Each icon helps you determine the values that coincide with each product. It communicates the research that we have done for our customers, to ensure that they easily find products that match their values. Customers' needs determine the kinds of products we carry and the direction our business will take. Wedge Worldwide has been a member of Green America since our inception. What makes your business green? Jessie: We are rooted in our founding values while addressing emerging developments such as fair trade, local purchasing and a variety of sustainability questions. Community members opened the Wedge Co-op in November of 1974. It was the first certified organic store in Minnesota. Over the last three decades, the Wedge Co-op has been an advocate for organics, fair trade and consumer health issues, and has promoted education about food and environmental responsibility. A percentage of the Wedge Co-op's profits is regularly donated to worthy causes through the WedgeShare Program. Further, we have undertaken our own Fair Trade Program. Jessie: The name for Wedge Worldwide came from a contest at the Wedge Co-op. Employees submitted their ideas for the new online business's name. Jessie: The biggest wall is to be a small company in an ever-growing market, rising above the noisy landscape and making yourself known. Another challenge is to ensure that our customers know what are commitments/values are and establishing validity in a market where customers can be skeptical of a company's motives (ie. green washing). Has your vision for your business changed since you began? Jessie: Our vision of Wedge Worldwide started as an expansion of the brick and mortar co-op. We wanted to expand our general merchandise availability, but have limited space within the actual walls of the co-op. We wanted more products to be available to our members for a longer period of time. The inventory turn around in store is so fast that it is hard to maintain a consistent product line, while meeting the needs of the many types of shoppers that we have coming through the store everyday. The website was intended for the Wedge Co-op shoppers, but it has moved into more of national resource than just a local resource. The majority of our shoppers do not even live in Minnesota or know much of anything about our history as a co-op. What advice would you give to other green entrepreneurs just starting out? Jessie: Believe in what you do and work hard to get where you want to be. It will be conveyed through your products and in your business. Running a business is not simple, but there are many rewards. The rewards may be small things. Take the time to notice each one of them, because they are what make the time and effort worth it. What one green product could you not live without? Jessie: I absolutely love Evan Healy's facial care products, particularly the Blue Chamomile Day Moisturizer.